Fitzgerald Business Centre is a space for work to happen. Fitzgerald & Partners helping to work to meet the needs of growing business and encouraging FDI. Flexible working space provider, Fitzgerald & Partners have opened a new co-working space in Kinsale town centre. The 20 desk spaces is a start of Fitzgerald & Partners Business Centre new offices that are laid out on the first floor, providing flexible workspace, co-working and private office space as well as social meeting and event space in the form of a meeting room. This is to drive foreign direct investment and contributing to Kinsale business eco system, meeting the needs of growing businesses in the area. Fitzgerald & Partners already work with a number of start-ups and encourages collaboration between is members. Its range of facilities such as complimentary business advisory service as well as workshops and networking events. 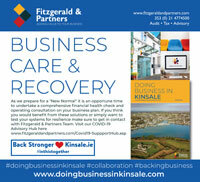 Fitzgerald & Partners are the producers of the highly acclaimed Doing Business In Kinsale which promotes Kinsale from a business and tourism perspective which can be read in e-book format and www.doingbusinessinkinsale.com. The trending co-working space is of particular interest from companies from a one person operation to staff between 5 and 10 people. It is a welcome addition to Kinsale and provides dynamic innovative, flexible working space and this is Kinsale’s first location in growing investment to entice start-ups, SMEs and multinational companies to the area. Since launching a number of new businesses which will be starting shortly in the heart of Kinsale, bringing jobs and vibrancy to the Kinsale town centre, an expansion of real tangible and vote of confidence in Kinsale as an enterprising town. Fitzgerald Business Centre offers an immediate set-up from €300 per month for a co-working community desks memberships, hot desks and private office space available upon request. Join The Fitzgerald Business centre- Innovation Hub & Book a Dedicated Working Desk From €300 plus VAT per month. All persons interested in a co-working desk please email info@fitzgeraldandpartners.com terms & conditions apply for all applicants.